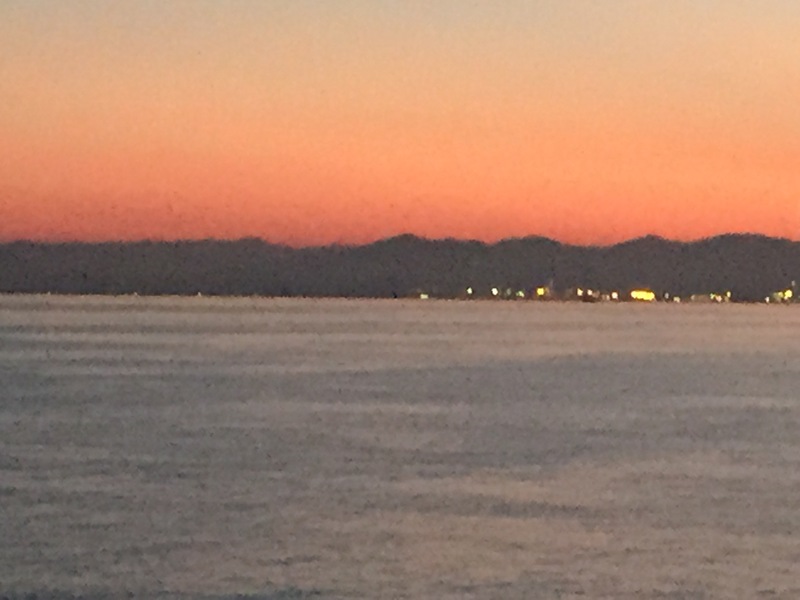 We sailed into the port of Livorno early this morning, and here was the sunrise from the balcony – a beautiful start to the day. Livorno is the second largest city in Tuscany with a population of 160,000. The town walls date back to the 17th century. I didn’t realize that Italy only became a unified country in 1861, before that there were districts, each with their own language, etc. Italian language only became consistent in the country in 1950. Still, our guide Marco says he can tell by the way people talk which area of the country they are from. Livorno is in Tuscany, but where we are going, Cinque Terre, is in Liguria. We were advised by Marco that people from Tuscany are pleasant, nice, they will smile at you, but they aren’t honest! The Ligurians on the other hand are grumpy, complainers and cheapskates, but honest and good workers! Is this an Italian guide legend or the truth? I don’t know, but there is a saying – “never let the truth get in the way of a good story!” We did see a lot of grumpy people though. This area is famous for its small medieval towns, most of them up on hills like the one in this picture. We passed many of them, and also passed by Pisa and the leaning tower. 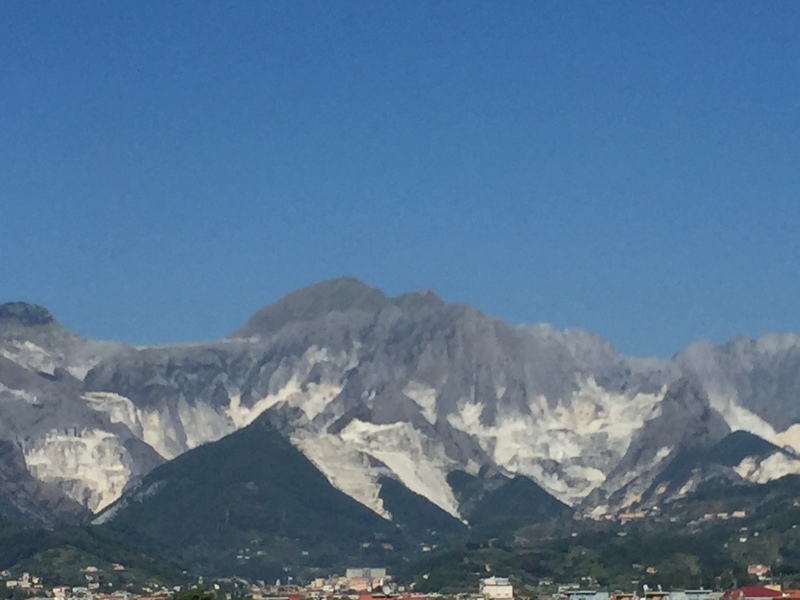 The town of Carrara is known for its white marble, mined from the surrounding mountains. The picture is not snow, it is the marble. From Livorno, it is a 90 minute trip to Cinque Terre. 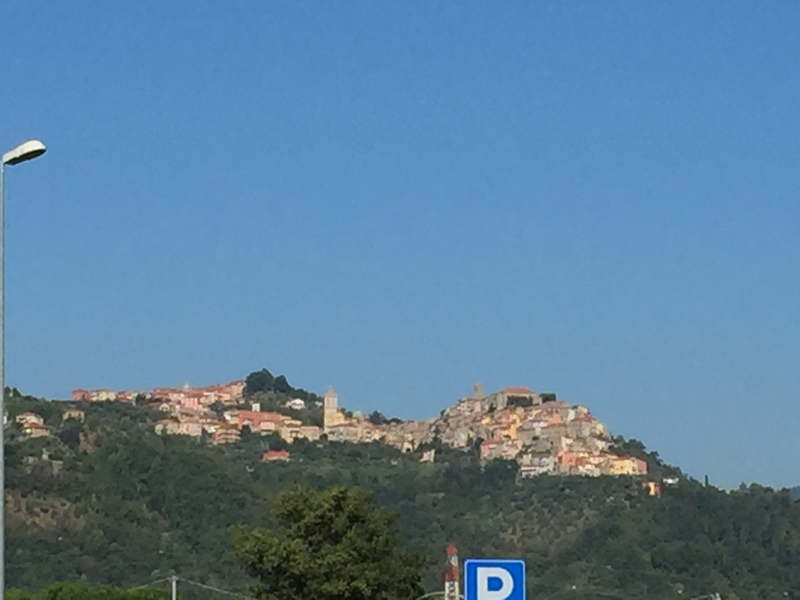 We first drove through the port town of La Spezia, then up a winding mountain road to reach the village of Manarola. We then walked a long way down to the village itself. Cinque Terre is made up of five villages and literally means five lands. 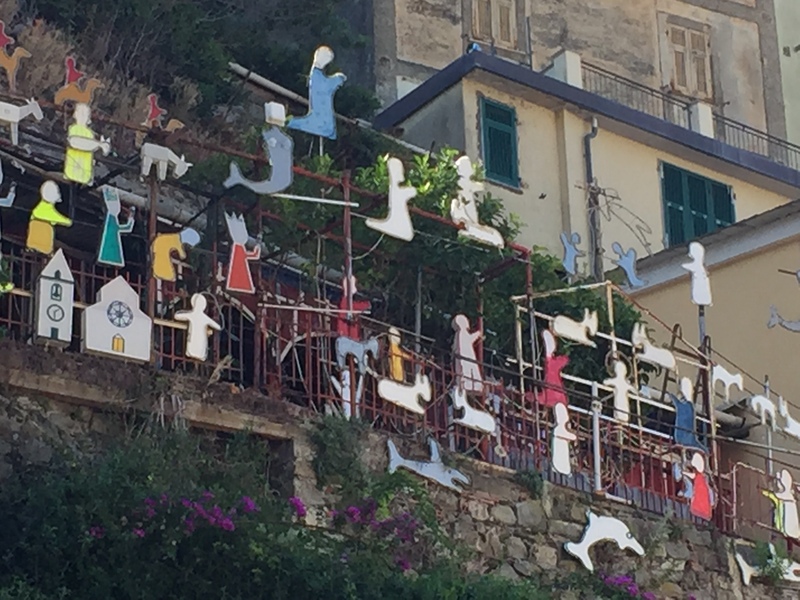 The villages are Monterosso, Vernazza, Corniglia, Manarola and Riomaggiore. 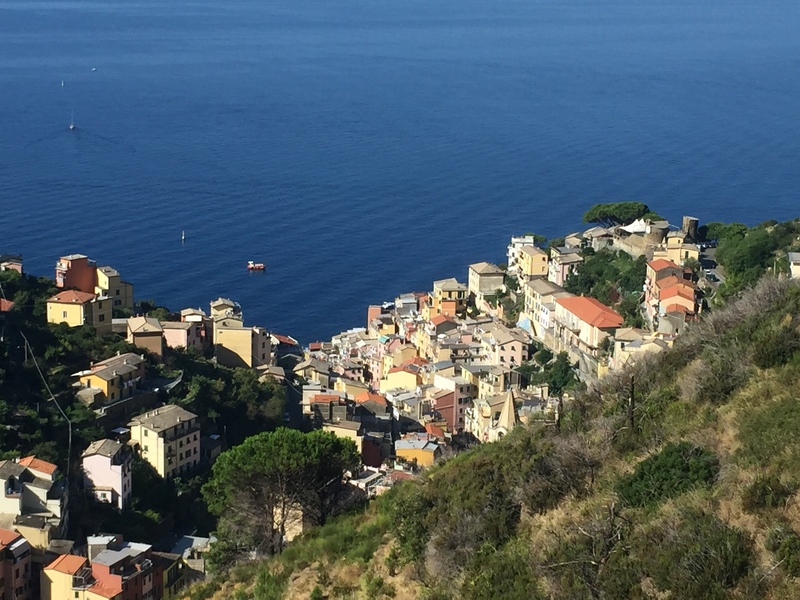 We visited Manarola, Vernazza and Monterosso. This area is really amazing and worth the visit. 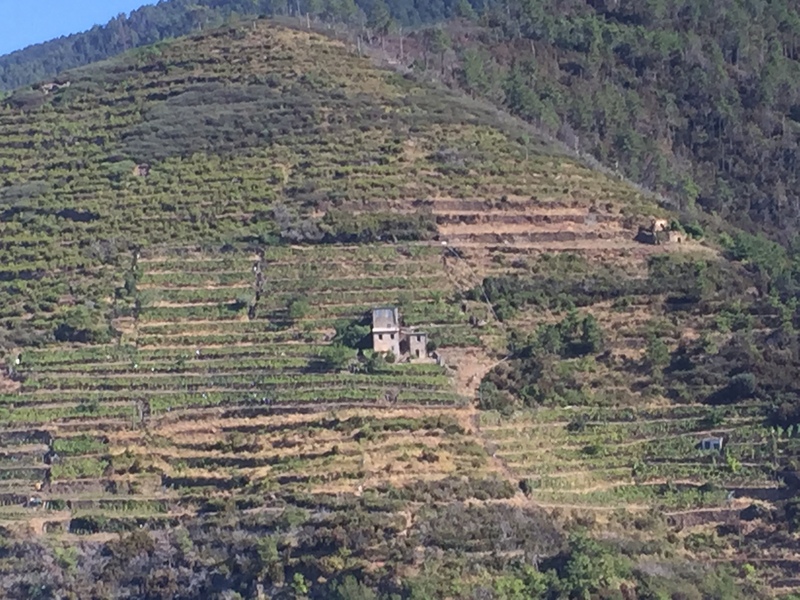 There are hundreds of acres of terraces and it is the perfect climate for growing grapes which are everywhere. My pictures will not do it justice. There are also lots of lemon and olive trees. The extra virgin olive oil from here is made from 30 different varieties of olive and is said to be one of the best in Italy. Cinque Terre is a proclaimed heritage of mankind by UNESCO and is now a National Park. Cars can’t travel from village to village so we took two ferries and a train, we also did a lot of walking. There aren’t really beaches as we know them in the first couple of villages, but that doesn’t stop people from enjoying the water. They sunbathe on rocks, jump into the water from them and just generally swim everywhere. In Monterosso, there are beaches with many umbrellas. Today was Saturday and also holiday time so all of the chairs under the umbrellas were occupied. There are white bags on some of the cliffs that are dropped by helicopter and are full of rocks to repair the terraces. We saw some people up there doing that repair. Mostly older people are still harvesting the grapes from the terraces, it is such backbreaking work, but it is their heritage. Marco says that younger people would rather be tour guides and bus drivers! 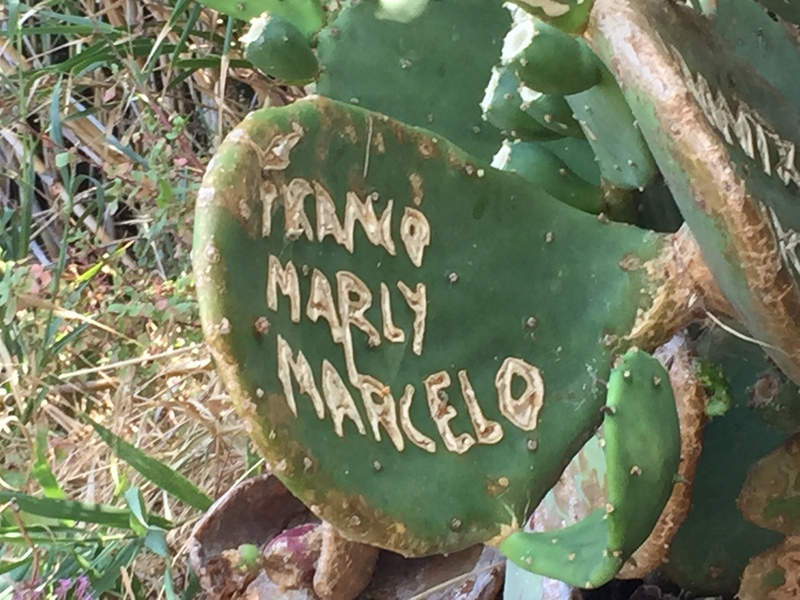 Now here’s something you don’t see every day, graffiti or names written on cactus! 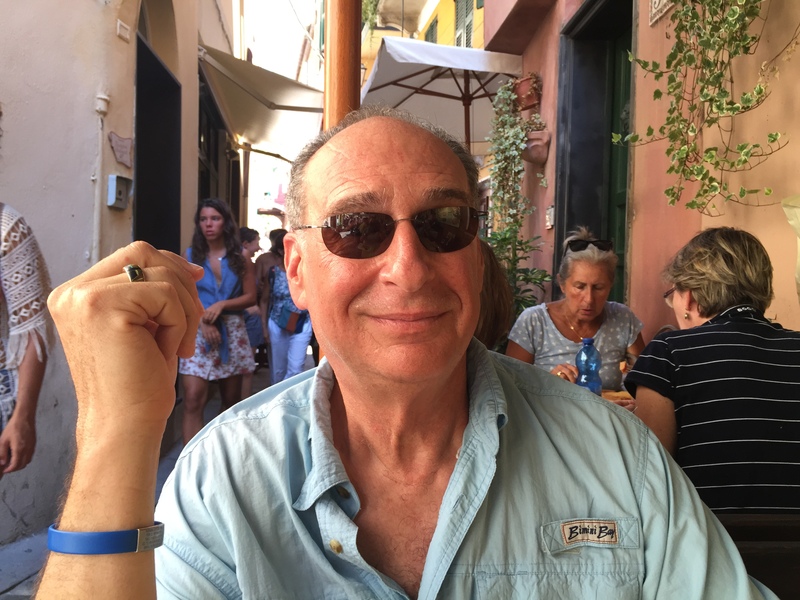 Norm having his wine and bruscetta in a sidewalk cafe in Monterosso. It was quite hot today and we enjoyed our lunch – the size of the bruscetta is unbelievable, and it was wonderful – I have a picture of it which again is too slow to upload. I had some delicious gelato too, of course. And, of course, a little retail therapy. I got some Italian linen – a jacket, blouse and scarf. Those pictures are slow to upload so I will add them later. We took the train from Monterosso to Levanto where we got on the bus back to port. Chef Mario went to market today and got fresh sea bass and sea bream as well as fresh mussels. The chefs grilled the fish and steamed the mussels in a delicious broth, right on the terrace deck, so we had a lovely dinner there. And a full moon tonight, what could make a great day even better? 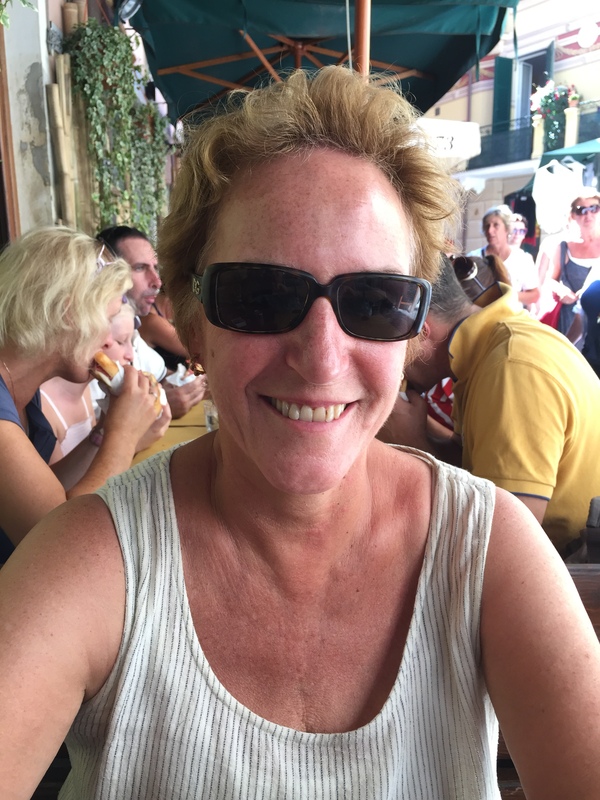 Pat and Norm: thought you might appreciate this photo– we LOVED Cinque Terre! The residents of Vernazza have done a tremendous job recovering from the great flood damage that was done there several years ago. 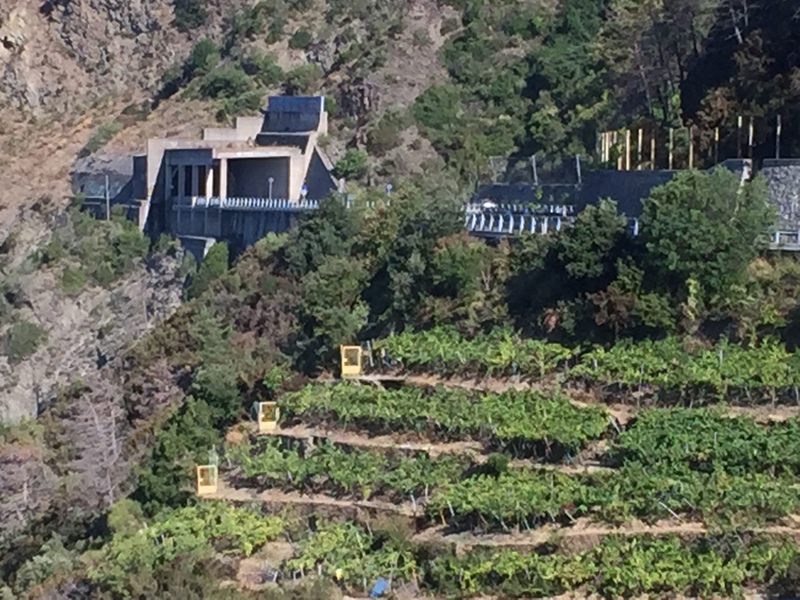 Loved the Cinque Terre region. Spent three nights in Vernazza and hiked everywhere. Man, is that water cold!! A place I have wanted to go , but have not yet … sounds lovely! enjoy..
One of our favorite memories in Cinque Terre was getting off the local train in the middle of a tunnel. Loved it.